I hear it all the time, both when I work with veterans individually and when I talk to veterans in the community. You’re not going to get ME in a therapist’s office. All they want to do is to bring up old stuff from the past. They’re just going to give me a bunch of pills. They’re not really going to listen to me. Where do you think veterans learn that going to a counselor is bad, or worse, useless? Some, from stigma and a place of fear, sure, but for others, from direct experience and shared information. A recent article in the New York Times by Dave Philipps highlights some of the impact of the mental health profession’s image problem with veterans. It’s a good article, well-written, by someone who knows something about veteran mental health. Philipps is the Pulitzer-prize winning author of the series of articles, “Other than Honorable,” a look at how military service members are separated for misconduct that could have been a result of their military experience, and Lethal Warriors: When the New Band of Brothers Came Home, a hard-hitting book that looks at the impact of multiple deployments and combat exposure on one Army unit. Philipps’ article about alternative therapies that many veterans are turning to describes the impact of veteran’s preconceived notions and misconceptions about traditional therapy. The article discusses the types of experiences that veterans are turning to in order to overcome the challenges they experience from their time in combat and the military: swimming with sharks, therapeutic fishing, outdoor adventuring, animal-assisted therapy, dolphin swimming, art collectives, yoga, martial arts. Don’t get me wrong, those things are great, but there is a significant component missing in veteran mental health when trained and experienced mental health professionals are not at the table. Another condition that has contributed to our collective image problem is a lack of awareness and understanding on the part of the mental health professional about the veteran’s culture and frame of reference. At a meeting recently to talk about our agency’s grant-funded program that provides mental health counseling for veterans, I asked, “why don’t veterans seek counseling and therapy?” The answers ranged from the typical stigma-type situations, in which the veteran does not want to admit weakness or fears some type of repercussion, but there were a couple of answers that hit close to home with our profession. 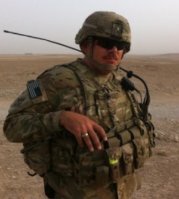 “When veterans go to talk to someone about their problems, the person’s not even paying attention to them, they’re just looking at the computer, typing.” With the requirements of insurance providers and managed care, I understand the challenge. We need to fill out the treatment plan and the case notes, get it in the system, so everything is correct when we submit to billing. Every time, though? And what’s wrong with explaining this to the veteran, who is perfectly capable of understanding it? Whether we intend to or not, the message is, “there is something else here that is more important than you.” The veteran already feels that way, why confirm it? Another response I got from the group: “They send us to people who have no way of understanding our experiences.” I have talked to veterans that have felt that the person in the room with them is scared of them or put off by them. That they find the veteran intimidating. 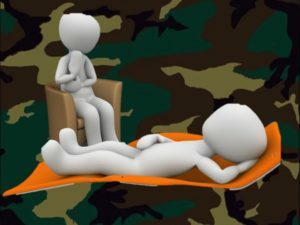 If the veteran senses that someone is not comfortable listening to them and understanding them, or that they are being pitied and treated as a victim in some way, then of course the veteran is going to reject therapy. These are real issues that I hear all the time from veterans, and these are veterans who have attempted to access treatment. Other colleagues in my practice have told me that veterans have asked them, “are you leaving any time soon?” The veteran does not want to have to start over from the beginning with another therapist in three months…they might as well just never start. “Thanks for taking the time to listen to me,” as if we were to do anything else with another human being? The challenge, as I see it, with these alternative therapies is that they are being used as a primary source of treatment rather than adjunctive or ancillary, precisely for these reasons. Philipps does a good job in the article talking to mental health professionals about the challenges of proving that real benefits exist as a result of these experiences. Anecdotally, they work because it makes the veteran feel better, but the underlying causes of the symptoms that swimming with sharks or running with wolves removes is still there. When the veteran comes down from the mountains, or up from the water, the core beliefs about themselves, their experiences, and the world around them are still there, unresolved and many times unknown. So what to do about it? Talk to veterans. Not just veteran clients, but veterans themselves. If we are interested in working with any particular population, we need to understand where that population is coming from. Talk to family, friends, reach out to local veteran organizations and ask them the same question I asked the community group. Talk to veterans with an open mind…why is yoga more appealing than talking to a counselor? Why could swimming with sharks and dolphins be more effective than traditional therapy? You may be surprised by what you hear, and recognize that it’s a PR issue, an image problem, rather than a question of effectiveness. If there’s anything that a veteran will do when you ask them a question, it’s give it to you straight, if you come from a place of genuine interest. If enough mental health professionals reach out to veterans to have real conversations about what they think about the profession as a whole, then perhaps we can get past the image problem and make a real impact on veteran mental health. I come from the Cowboy culture and our view of seeking mental health counseling is much the same as that of the military. I have been excited to see the increasing amount of outdoor adventure type activities available for veterans, but disappointed to learn that no real professional counseling is included. My view is that those activities can be a useful tool to initiate an introduction to counseling. I think a combination of adventure in the morning and counseling in the afternoon, or perhaps alternating days of adventure with counseling, etc. would be an effective mix. I achieved great results with my issues towards re-integrating to “normal” life when I attended a Cloud and Townsend Resources seminar that utilized process groups and a variety of counseling techniques. I am very interested in either finding or developing a program that can reach veterans by utilizing exciting and engaging activities, combined with quality counseling sessions and process groups. I would love to continue this conversation with you sometime to get your input.